This book examines the interrelations between language and society in the German-speaking countries. The questions 'what is German and who speaks it?' and 'how does the language vary dependent on social, political and geographical factors?' are addressed and placed in their historical context. 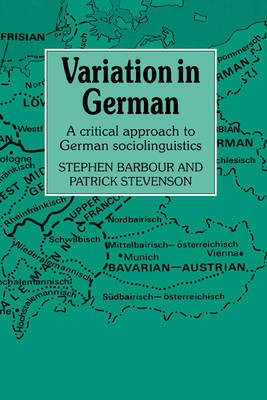 This is a comprehensive account of major topics in the contemporary study of German sociolinguistics, and topics covered include the history and development of the German language, German as a minority language, minority languages in German-speaking countries, traditional dialects, variation in contemporary colloquial speech, the influence of English on German, and German in East and West. It draws together much otherwise inaccessible material from a great range of sources. The authors also assess critically research work carried out in German-speaking countries.